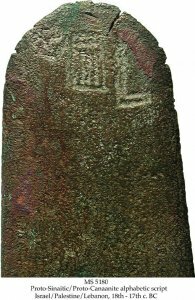 Description	 MS in Canaanite West Semitic on bronze, Israel/Palestine/Lebanon, 18th - 17th c. BC, 1 axe, 19x5 cm, (2x3 cm), 1 line with 3 letters P or G, H and K in Proto-Sinaitic/Proto-Canaanite consonantal alphabetic script. 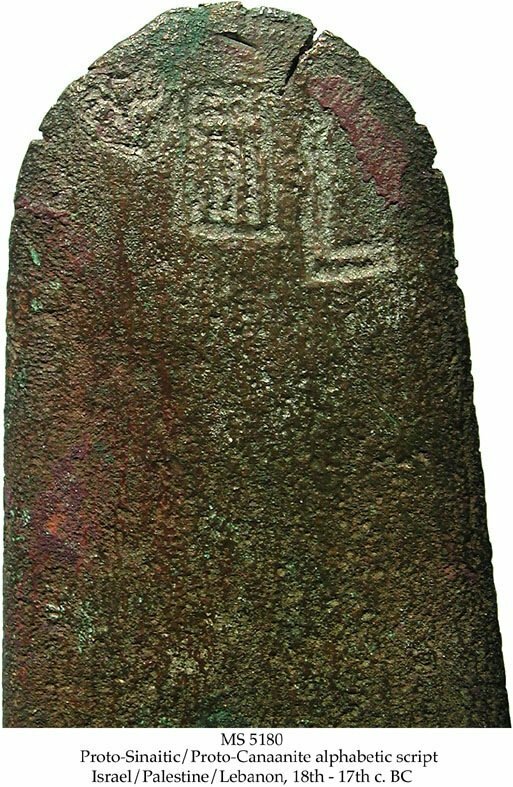 Context	 There are about 50 short inscriptions carved by miners at the turquoise mines at Serabit al-Khadim in Sinai, and less than 20 inscriptions found in Israel/Palestine (Shechem, Gezer, Lachish), all except 3 in public collections. Provenance	 1. The Gil Chaya Collection, Jerusalem and Geneve. Commentary	 This is the earliest alphabetical writing known. There are less than 30 pictographs/letters. The invention might have come from knowledge of Egyptian hieroglyphs, which had signs for consonants, but the Egyptians never used these alphabetically. Since the language is Canaanite West Semitic and not Egyptian, the invention probably took place in Israel/Palestine/Lebanon. This might have been the only script and language available in Sinai (apart from Egyptian) when the 10 Commandments were written down 16th-13th c. BC. Phoenician alphabetical script, ca. 12th c. BC, is the direct descendant of the Proto-Sinaitic/Proto-Canaanite alphabetical script (see MS 715), which again, developed into the Greek alphabet around 800 BC (see MS 108), that was the basis of the Latin alphabet. The developments of 1. language (spoken communication), 2. writing, 3. the alphabet, and 4. printing, are among the highest achievements and milestones in the evolution of humanity. Published	 To be published by Andrè Lemaire. Exhibited	 The Norwegian Institute of Palaeography and Historical Philology (PHI), Oslo, 13.10.2003-06.2005.